Peter Oyloe in Search: Paul Clayton. BOTTOM LINE: If you don’t know Paul Clayton, you should fix that and go see this fun “wiki” folk musical. The sad truth about Paul Clayton is that most of you reading this probably have no idea who he was. Even if his name rings a bell, you may not be fully aware of his extensive discography, his encyclopedic knowledge of folk music (and folklore), or his significant mark on the genre between the ‘50s and ‘60s. You probably know his famous contemporary, Bob Dylan, but did you know that he was Dylan’s first mentor? One could even argue were it not for Clayton’s affection for the folk superstar there would be no Bob Dylan; yet Clayton’s influence is mostly overlooked. So, Larry Mollin is trying to set the record straight in his fun “Wiki Folk Musical,” Search: Paul Clayton. The show could be defined as a “jukebox musical,” but I’m surprised by how much it doesn’t feel like a juke box musical. 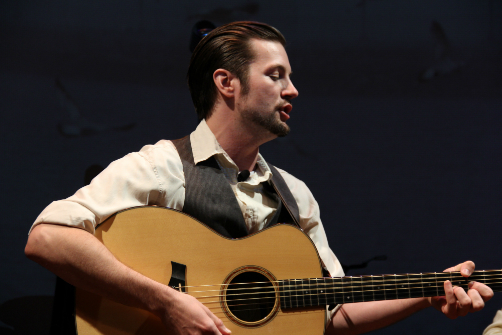 The show follows both the life of Paul Clayton and the music that influenced Clayton. As we learn more about the musician, he and his friends play songs as a way to collectively reminisce about the past. We are introduced to a smattering of pieces by Clayton, Dylan, Rev. Gary Davis, Joan Baez, Dave Van Ronk (a.k.a. the “Mayor of MacDougal Street”), and others, while Clayton (Peter Oyloe) offers us a glimpse into his worldview. It begins in Clayton’s early years with his musically inclined family, and then we see his time as a student at the University of Virginia. Clayton grew up with a wealth of musical talent, but his student years laid down the groundwork for his life as both a musician and a scholar. As he continued to make a name for himself in the folk crowd, he eventually moved to New York City where he would fall head-over-heels in love with Bob Dylan (Jared Weiss). He took Dylan under his wing and introduced him to all of the right connections. Yet, for all that Clayton introduced him to, as Dylan kept climbing the ladder he left Clayton and his Greenwich Village friends behind. Thus begins a tumultuous friendship wrought with plagiarism, betrayal, and unrequited love. Oyloe and Weiss’s chemistry on stage is simply magnetic. They don’t even need to speak for us to understand the full complexity of their friendship. When Dylan barges in to Clayton’s apartment for shelter during the 1965 blackout, Oyloe’s conflicted expressions are infectious -- when his Clayton is hurt, the whole audience hurts with him. And the musical talent of the entire cast deserves its own round of applause. Allan Harris as the charismatic Rev. Gary Davis could be a show of its own. I also appreciate the show’s emphasis on relevant issues of plagiarism and copyright, especially as it related to Dylan’s notorious reputation for taking his colleagues work; at which point does an artist cross the line between effective borrowing and stealing? Search: Paul Clayton proves itself as both an informative and entertaining piece of theatre. There are points when the songs do not fit so perfectly with the plot. Michael Lanning’s performance of Dave Van Ronk’s “House of the Rising Sun” is so spot-on the audience could barely contain our excitement. It also serves as a nice reference to an earlier conversation about Dylan stealing the song from Van Ronk, but I cannot fully wrap my head around how it moved the story along. Even so, the show is a fun evening of live music perfect for any fan of folk with a hankering for '60s nostalgia.